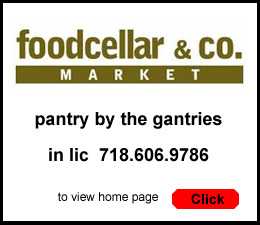 July 13, 2013 / Dutch Kills LIC / Restaurants in Queens / Real Estate in Queens / Queens Buzz. Last fall I embarked on a bit of an adventure when Michele Beaudoin of Beaudoin Realty Group [a QB client] introduced me to Daniel and Shaun Dougherty. She had just sold the brothers a two-story, corner building that had been a Beauty Supplies store along Crescent Street in the Dutch Kills neighborhood of Long Island City. The Doughertys had plans to convert the building into a restaurant. 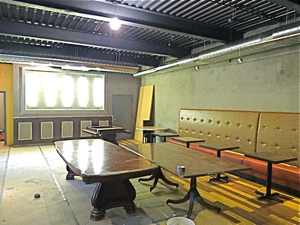 Likely the first restaurant of its kind in the Dutch Kills neighborhood of Long Island City. Click here to read the rest of the story about the gentrification of the Dutch Kills neighborhood of Long Island City and the making of the Crescent Grill restaurant in LIC. 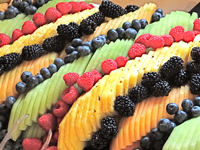 The story includes information and photos about the design and construction of the renovated building, as well as a review of some of the culinary delights that await those who patronize the restaurant. 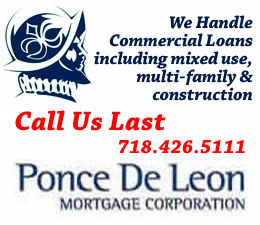 July 13, 2013 / Dutch Kills LIC / Restaurants in Queens / Real Estate in Queens / Queens Buzz. Continued. I met the brothers, Shaun and Daniel Dougherty, one rainy evening in October 9th of 2012. It had taken us a while to arrange the visit as they were busy making preparations for a new venture that would likely change their lives. 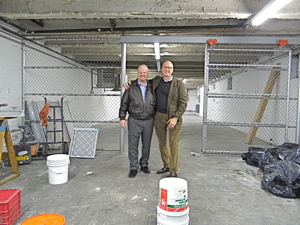 We met at the doorway of the lower level, which would one day become the receiving area for the new restaurant. It was located at the foot of a large shady tree off Cresent Street along 39th Avenue, which in some respects seemed ideal for taking deliveries as there does not appear to be heavy traffic on the street. Pure Vision: State Of The Art Kitchen And .. The lower level of the inside of the building was in many respects what you’d expect: a large, voluminous, empty space [see photo at left]. It had very high ceilings and Shaun explained how this would be the perfect place for the kitchen and the administrative office. As he explained things to me - where the grill would be, the refrigerator locations, the ovens, exhaust fans, incoming and outgoing plumbing and storage - it was apparent that he’d already spent plenty of time conceptually mapping out his game plan for the lower level kitchen conversion. Daniel talked about his role as an investor and business partner, while Shaun would assume the House Chef and General Manager. Shaun had been working in the culinary arts for decades, in Napa Valley, St Croix [Caribbean], Montauk [Long Island] and in Manhattan. And both would oversee the restaurant operations with the help of their sister Kelly in the dining area and Jaime Jones, the Sous Chef, in the kitchen. I could sense they were both excited about the venture, while cognizant of the significant risks they were taking, by opening the first independent nouveaux cuisine restaurant in the Dutch Kills neighborhood. We went upstairs to take a look at the new ‘restaurant’ [see photo above]. Daniel had mostly listened as Shaun had laid of the configuration of the kitchen downstairs. But upstairs,in the main dining and bar area, the brothers began telling me about their vision in a sort of tag team staccato performance, with which I tried to keep up. 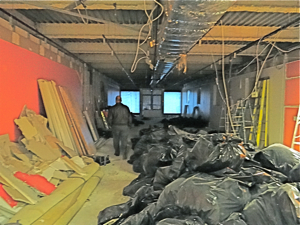 What lie before me on that day, was a large vacant roomful of debris [see photo above]. But what lie ahead, was a vision of a fun, hip, happening restaurant with great art and great eclectic nouveaux cuisine. After our conversation and taking a number of photos, I departed into the cool, wet drizzly night. 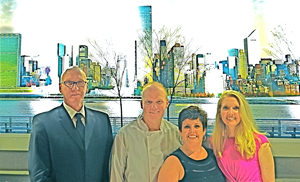 I returned to the restaurant on May 18, 2013 as the Dougherty brothers had signed up to participate in the LIC Arts Open. Daniel is a longtime resident of LIC, had long ago purchased one of the few brownstones in LIC and Queens, while the houses were still affordable. If his vision in real estate is any measure of his vision for opening new restaurants in Dutch Kills, the Crescent Grill has much to look forward to .. The restaurant was nearly completed. Shawn gave me a tour of the downstairs operations, showing off new grills, freezers and refrigerators, all of the plumbing and air handling infrastructure designed to make the Crescent Grill kitchen operations a state of the art facility designed to enhance the efficient creation of culinary delights; and an operational kitchen to be fully compliant with city, state and federal regulations. Upstairs the walls had been mostly finished, some of the tables and chairs had arrived, and the art gallery had been hung with the paintings of local artists for the LIC Arts Open. They had nearly finished the stylized bar, as well as the building façade, and they informed me that they were hoping to have an early Summer opening. I snapped a few photos and asked them to invite me to the opening so I could finish my story, by tasting the food, as this was to be - pardon the expression - a soup to nuts report of the building conversion: one of Dutch Kills first independent gentrification efforts since all of the new hotels were completed only two years ago. 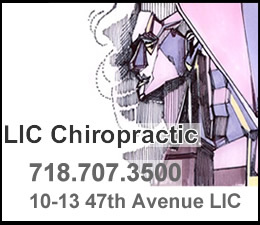 In early July I received my invitation to the opening weekend at the Crescent Grill in Dutch Kills LIC. 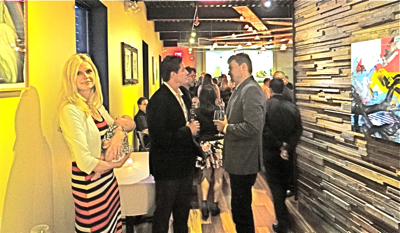 It was an invitation only event, comprised of many of the people who helped make the new restaurant opening a reality. This included Orestes Gonzales, the restaurant designer [in collaboration with Shaun and Daniel], James Cornejo, the construction architect who supervised the renovations and implementation of the design, and Michele Beaudoin, the realtor who sold them the building. I was told that Steven Yang of Focus Design Group was also there, but I did not meet him. There were other local folks there too, many of whom have been long time friends of Daniel’s. I knew a few of them by name including Zoe Morisette, an LIC artist, Chrisoula Georgakoupolous, a local realtor, and Dominic Stiller and his wife [name not on the business card] who will soon open another new restaurant only blocks away named the Windmill. I also met Steve Kanellos, co-owner of the Court Square Diner, and the former owner / chef of a three star Manhattan restaurant that had just closed in a real estate buyout transaction. He commented on how much he liked the crowd in attendance of the opening. Would The Buffalo Springfield Say That Something's Happening Here? The 1960's and 1970's came streaming in, through an old Buffalo Springfield tune. 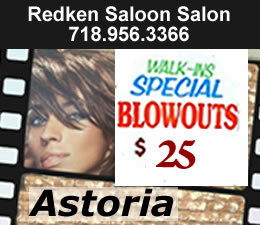 Everyone in western Queens knows it. Somethings happening here and what it is ain't exactly clear. So onto the food and staff and final look and feel of the restaurant as a whole. It’s gestalt … if you will. I snapped photos of the entire event, many of which you can see in the slide show below. Kelly, Daniel and Shawn’s sister greeted me at the door. She was gracious and charming and a bit disarming. She told me that the whole family had come to the opening, including all of their siblings [nine children] as well as their parents, who hail from Johnstown, Pennsylvania where their father had been a steelworker foreman for Bethlehem Steel at a time when American industry was still producing for the world. I met one of the oldest brothers, who seemed to be a fun loving guy, a bit like an uncle who’s prepared to tell it straight and tell it all. He regaled me with a tale or two of Shawn’s teen years, when Shawn took a few chances with his older brother’s spider. The risk taking continues and the brother reminded me a bit of Joe Biden. The food came out and soon became a series of unexpected pleasures. When a new restaurant opens, you really never know what to expect: it could be a hit, or it could be a miss. Tonight, thankfully, the Crescent Grill Chef starting hitting home runs like New York baseball greats, Babe Ruth and Willie Mays. 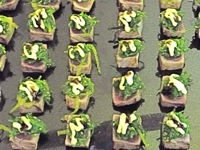 The first appetizer I sampled [the event was appetizers only], was a combination of fresh seared sashimi tuna with Asian seaweed, with a wasabi mayonnaise and a balsamic glaze. It was a high grade, fresh and tender tuna covered with a light neutral moist but not wet, seaweed. And the wasabi and balsamic gave the dish a slightly sweet, horseradish flavor. It was the best sushi tuna I had had in a long, long while. This had the effect of leading me to begin to expect great things. 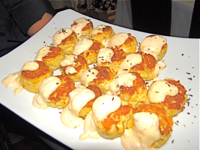 Next out of the kitchen came a plate full of appetizer-sized crab cakes partially covered by a cream remoulade sauce. 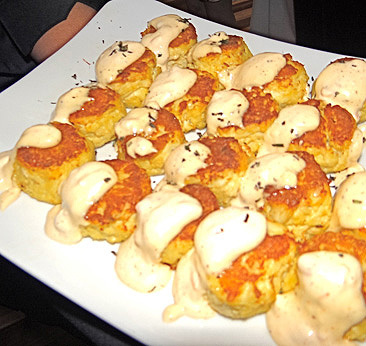 I happen to love crab cakes – and they’re rarely made right – but these were out of this world. The crab cakes were moist inside with a lovely mixed texture, and slightly browned on the top. The cream remoulade sauce was sparingly sweet, like the French would make it, with a muted panoply of completely ground herbs and vegetables. The Cresent Grill food had quietly taken center stage of the opening night reception. At first it was the ambiance, followed by an eclectic and interesting crowd, but now it was all taste buds on deck as these were delights that one encounters infrequently. The mushroom croquettes followed the crabcakes. It was quickly apparent that this breaded round balls weren’t going to play second fiddle to the crab cakes. 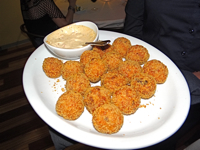 The croquettes had a breaded soft dense exterior, followed by a moist bed of cut shitake mushrooms underneath. The mushroom croquettes were accompanied by a light Creole cream sauce. Mmmm. I was getting thirsty, so I asked one of the waitresses if I might get a splash of wine. I tried the Clovis Point Merlot, which was a full bodied, slightly aged, grape heavy delight. I thought it was Californian, but to my surprise, it had come from vineyards of Long Island. It seems that Shaun’s time in Napa Valley wine country had taught him well, and some of his time on Montauk was likely spent sourcing great seafood and fine locally made wines. I had found the Crescent Grill gentrification project interesting; but there's nothing so interesting as that which speaks directly to the senses. Pardon me, I believe the Duck Meatballs have arrived. 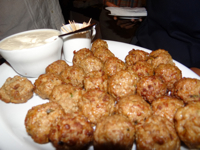 The Duck Meatballs were served with a horse radish cream sauce. These were tender and moist, and a nice change from beef. But what came next seemed hardly possible - something that might possibly have eclipsed some of what had preceded it. The grilled polenta, topped with sauteed mushrooms, a dash of pesto, and a couple of a mild cheese shavings broke apart in my hands as I tried to lift it to safety. It fell into my mouth like a heavenly indulgence for good behavior. 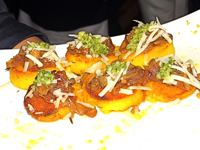 The soft warm polenta, were followed by the savory mushrooms and complemented by the pesto and cheese. I had to have another, and must not be distracted from my work. It’s worth taking an aside to comment on the service provided by the Crescent Grill waiting staff. For a new staff, they were extremely attentive to detail. If I left anything on a table for very long, it was bussed. And the waitresses serving the food had been well versed about what they were about to serve. I can only assume that Daniel and Shaun had hired a number of experienced waiters and waitresses, and if not, trained them well. Braised lamb on a house panini with red pepper and curry was next out on stage. These were so popular that I didn't get to them until about half of them were gone. 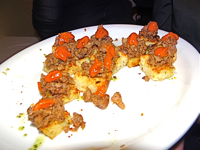 The lamb was moist, complemented with a light sauce and topped with a warm, soft red pepper. 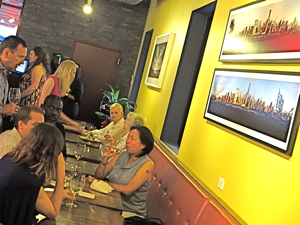 I shot photos of many of the crowd, including the former Manhattan restaurateur, our hosts with some of those who helped them make this happen, and some capturing some of the ambiance of the restaurant as well as the opening night crowd. 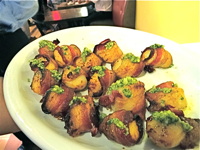 It was near the end of the party when the hand picked scallops wrapped in bacon and topped with fresh pesto sauce came out to play. The scallops and the bacon were both soft and tender, with a salty, pesto flavor. I had enjoyed the show immensely and was already looking forward to a return visit. The bar was made from a 150 year old black elm tree from Pennsylvania and finished in Queens by Steven Yang of Focus Design Group. The bar chairs were purchased at a stylized furniture shop in Manhattan. And the large panoramic photos behind the bar and hanging on the back wall of the restaurant were shot by Orestes Gonzales of LIC. Lastly, the fine stylized woodwork on some of the walls and the wooden lighting fixtures were created by Ignatius "Iggy" of Long Island City. All in all it was an interesting journey as I watched a couple of brothers pool their resources, like the immigrants of old, in the interest of serving the community and possibly making better lives for themselves. I reckon the real test will be how well the Crescent Grill can draw patrons from nearby hotels and from the corporate offices of Queens Plaza. It appears Queens Plaza has enough critical corporate mass to enable local business lunches. And we hear tell that the local hotels have been doing fairly well, providing the Crescent Grill with a steady opportunity to attract new customers. The Windmill restaurant is expected to open sometime soon. And one migtht ASSUME that the casual interest shown by some of the other NYC restaurateurs at the opening reception, may one day become more than that. It’s certainly within the range of reason to believe that the Dutch Kills neighborhood is on the verge of change in more ways than one. 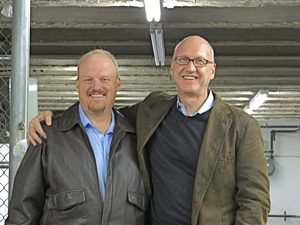 In the photo to your right, taken on October 9, 2013, are Shaun and Daniel, the two brother partners, on the verge of a great adventure. The Crescent Grill is located at 38-40 Crescent Street at 39th Avenue, which is about 3 blocks due north of Queens Plaza and a stone’s throw from about 10 to 20 hotels in the Long Island City neighborhood. Click here for a map showing the location of the Crescent Grill restaurant in the Dutch Kills section of Long Island City. Brunch runs from $8 to $18, Lunch from $13 to $18, and Dinner from $12 to $18. and the Appetizers range in price from $9 to $15. They are open Monday through Sunday from 11 am to 11 pm, but they're considering closing one night, after they figure out which night it should be. Click here for a related story about the hotels - many of which have restaurants - in Dutch Kills section of Queens. 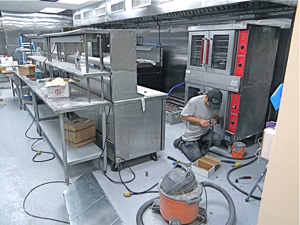 The following slide show contains photos of the making of the Cresent Grill in LIC. Click here to go directly into the photo album containing photos of one of the newest restaurants in LIC.